The chessboard upon which the game of chess is played is made up of sixty-four squares, eight columns and eight rows in alternating colours of black and white, or light and darker shades of wood. In competition chess the boards will be coloured dark green and light buff. Essentially the chessboard is the same as the board used to play English draughts or American checkers, although the in play the chessboard is laid in a different orientation from draughts in that the board is placed between the opposing players with a white square in the bottom right hand corner. 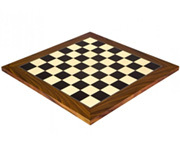 Nowadays there is an enormous range of chessboards available, from low cost cardboard and roll-up vinyl, to ebony and ivory, glass, marble and pearl. Some chessboards are made with such precision and craftsmanship that they are elevated to the level of art or artefact! The most popular and widely used chess board is the flat, wooden type and is the preferred choice of most privately owned chess sets. A really basic one could consist of a square piece of light coloured plywood. The chess squares grid can be screen printed directly onto the wood in black ink. Here you can have a perfectly serviceable chessboard. But because of the exalted status of the game of chess many people prefer to use a board more fitting to be used for 'the game of kings'. Hence the demand around the world for craftsman built, beautiful boards with fine veneers and inlays that would be serviceable possibly for generations! Ideally a chess set should be a majestic and exciting thing, inspiring you to enter the wonderful world of chess playing, also something which is desired as a personal possession for its aesthetic qualities and superior craftsmanship. Some very early chess boards were made of leather. There are also boards made of stone, but mankind's quest for novelty and originality has produced an overwhelming variety of unusual chessboards. There are boards where the squares have become circles. There is a board with an undulating Dali-like surface with peg holes to fit the pieces. Also a board that has scalloped squares on which the pieces can rock and spin. There are even chess boards made of pastry, using pieces made with pastry cutters…mmmmmm, tasty! There are radical boards which have eve departed from the flat surface to become a series of steps where pieces move up and down the steps. Some bright spark designed a board in which each square is a folded GB £20 note, the pieces are little piles of money of different values the bronze one pence coins being the pawns. The dragon chess game actually consists of three tiered glass boards on which an array of medieval looking characters are involved in a complex multileveled game. The game was invented by the creator of the popular "Dungeons and Dragons" games. 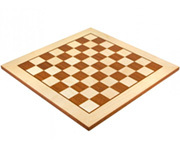 As well as flat boards, there is a vast range of folding chessboards. These are hinged boards that can become a casket to keep the pieces in. This is a clever way to store your whole chess set in a convenient, easily transportable box. The chequered board becomes the decorative design on the outside of the box. Simple and clever! Some of these folding chess sets have the appearance of an antique book, so they can be conveniently placed on the bookshelf on permanent display. These designs were favoured by medieval English churches as they gave the game of chess a more scholarly look. 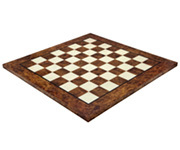 We stock one of the biggest and best selections of chess boards for sale in the UK. We buy only from high quality suppliers based in Europe including Italfama and RECHAPADOS FERRER S.A. Our boards start at just £32.00 and stretch to over two hundred pounds for our supreme quality luxury lacquered boards. Unlike other retailers we stock a complete range of sizes of most of our boards. You can select the size you require at the time of ordering. It's worth noting that none of our wooden chess boards are sourced from the far east where quality is as low as the prices. We only source them from approved European suppliers who guarantee us the best quality. In addition to the bog standard boards we also sell a superb range of luxury boards. When you consider the quality of some chess pieces it seems silly to place such things on a basic chess board. If you want to give your luxury chess pieces the chess board they deserve then our range of luxury chess boards is the place to choose from. There is something magical about seeing the reflection of the chessmen in the surface of the board. Another aspect of our boards worth boasting about is the fine hand inlays of rich wood veneers. Our Italian chess boards are all hand inlaid to perfection from stunning cuts of richly grained woods. All of these fine examples are available through our website at an unbeatable price.